The High Brow Cat team congratulates the following NCHA World Championship Finalists on their accomplishments this year. $5,000 Novice-Non Pro Reserve World Champion CP Jesse Cat, by High Brow Cat and out of Jessies Starlight MS by Grays Starlight. Owned by Tommy and Susan Marvin of Barnsdall, Oklahoma, the stallion scored a total average of 439.5 and ended the year with earnings of $29,762 and lifetime earnings of $123,722. Ridden by Susan, the chestnut was also the 2015 AQHA Level 2 Cutting Reserve World Champion. In third, was Clays Little Kit Cat, owned by Dawn C. and John Chapman of Chandler, Ariz. The gelding sired by High Brow Cat and out Clays Little Kit by Zack T Wood earned a year-end total of $27,489. Clays Little Kit Cat returned to take third place, as well in the $5,000 Novice Division under the hand of Mike Wood of Scottsdale, Arizona. Wood and Clays Little Kit Cat had an outstanding World Finals, scoring the highest overall cumulative score of 442.5 to earn a total of $3,712 at the World Championships, bringing their year-end total to $38,378. 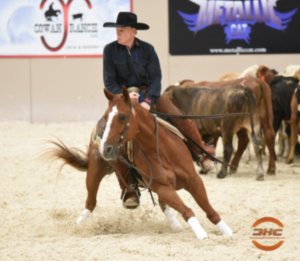 Williamson and Sweet Little Cats, who also won the NCHA Non Pro Mercuria World Series event at the All American Quarter Horse Congress, scored a total of 850.5 in the Finals, earnings $8,931 to bring their year-end total to $99,444. The stallion has lifetime earnings of $183,601.